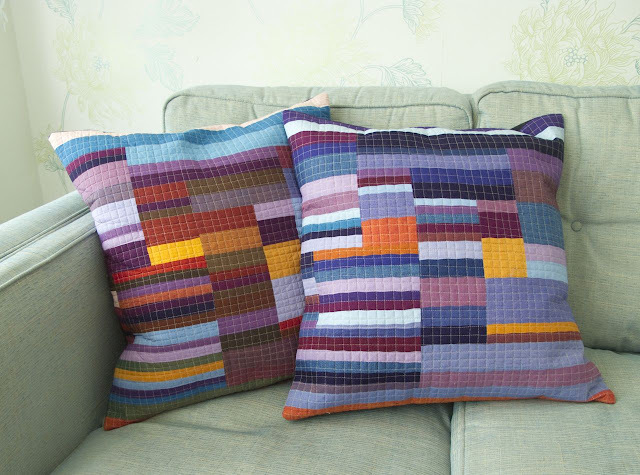 The London Modern Quilt Guild challenge for this month is to use solids to make something inspired by abstract art. I love a challenge and coincidentally really like to avoid work whenever possible, so this was a match made in heaven. I love Paul Klee’s work, none of which is a quilt, but really could be. After revisiting my shot cottons quilt last week it occurred to me that these fabrics have a really nice painterly quality that would work well here. So, armed with a bit of graph paper, I sketched out a design based on this painting and got to work. There were a whole load of partial seams to sort out, but it came together really nicely. 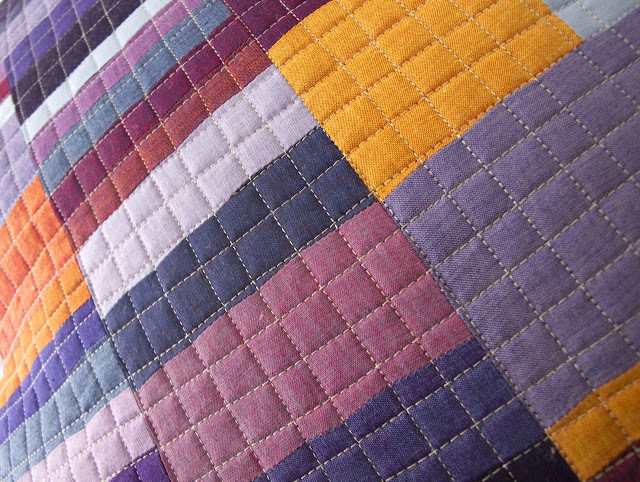 I quilted it in a grid of not-at-all-straight lines (I just can’t be bothered to get the hang of keeping them straight) and made it into a cushion cover. And then I accidentally made another one in a slightly more restricted palette. It’s like they breed when I’m not looking, seriously, I don’t know how it happens. Anyway, the entire sofa is now covered in homemade cushions, which I love right up until the moment they all get thrown on the floor by one of the kids. And, let’s face it, the husband. Sigh.